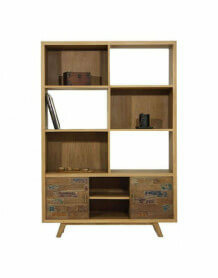 TV stand in solid wood, Nordic design. 4 open storages L40 x P40 x H12,50 cm. 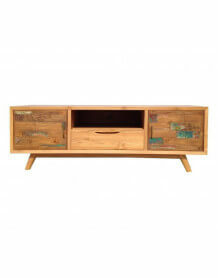 TV unit made of solid teak wood. 2 central doors with hardwood patchwork softly colored in shades of brown and blue. With its slightly Scandinavian design, this TV stand is in the current trend and fits perfectly in a modern home by providing a warm touch of wood.